After a poor start to the season fishing the remote Witte River in mono-vision, due to the loss of a contact lens en-route to the stream, I decided that the weather was looking good and it was time for me to head out onto the water and, if you will excuse the pun, “get my eye in”. The weather was perfect with a very slight downstream breeze on the river, the first few runs didn’t show any fish and I switched from a spider to a beetle. Then I spotted the first rise, I have to admit I was somewhat in haste and made the cast from a less than idea position. The fish came up for the beetle but an intervening current grabbed at the leader and drag set in, game over. I chastised myself for being impatient and carried on up-stream taking more care, slowing down, scanning the water carefully; and then I saw it. The languid rise of a massive trout, bigger than I have seen on these rivers before and quite obviously a brown, even at this distance the spots were easily recognisable, it looked huge. I watched for a while, and now and then, the brown would put in a spate of rises, each time his tail wagging good-bye well above the water. 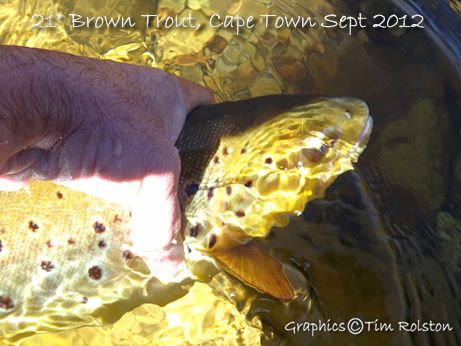 Large trout head and tailing give away their size from the delay between the break of the surface with their noses and the wave of the dorsal and then tail as they sink back to the depths. This one took an age and was obviously huge by local standards; by most standards to be honest. After the previous error of judgement I was determined to keep cool and get into position, a practise cast for the distance and I delivered a little olive over the lane in which the fish was feeding. Not a murmur, I changed the tippet down to 7X and pushed the leader to 18 feet long. Another cast and the fly was ignored, so I added a nymph. The tiny brassie which tends to be all things to all fish landed perfectly and drifted back over the fish, but again no response. I feared that I may have put the fish down, despite my care and stealth, I waited, the fish fed in batches, three of four rises in quick succession followed by a pause that had me thinking that he had gone down again, I waited some more and he rose again. A long drawn out languid roll on the surface to something far too small to see.. This time a size twenty ant was affixed to the leader, it is a very good bet when you are stuck and the fish was obviously not eating anything particularly large, this pattern has produced most of my bigger fish on these streams and I was hopeful that it would break the impasse, however two drifts and the ant was equally ignored, not so much as an inspection rise and I was getting stumped. I knew that it was only a matter of time before a wayward cast put the fish down but what to try next? 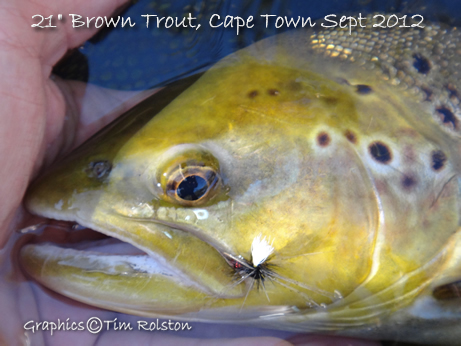 The fly that eventually fooled the fish was a version of the above pattern. I tied on a #12 black and red parachute spider pattern sporting long wiggling Coq de Leon halo hackle and lots of life simulating movement. I hoped that perhaps, although much larger than the natural fodder on which this trout was focused, it may trick the trout into thinking a tasty terrestrial had dropped out of the bush representing easy pickings. The fly alighted without so much as creasing the surface film and drifted down the slow current on the edge of the stream that held the trout, I mended the intervening line upstream to compensate for the different current speeds and the fly drifted perfectly over the fish’s lie. 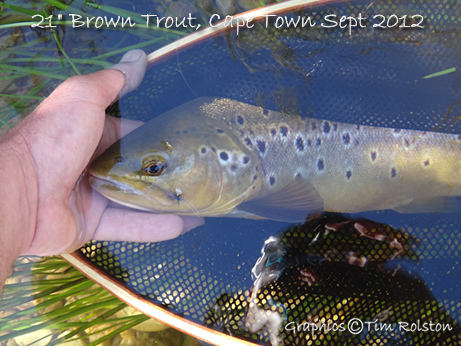 A tilt of his fins and he glided up and inhaled the fly with total confidence, I had to steel myself not to strike too soon, very easy to mistime things with these larger fish, particularly the browns which seem feed with a remarkable lack of haste. Trouble was that, after setting the hook, the game was far from over, this fish was huge for this stream and pretty close to the limit of what one may hope to land on 7X tippet in relatively high water. He bored away upstream and I kept as much pressure as I dared on him, being forced to give line and then more. Fortunately it was quite a large run and he had space to move without too much risk of finding a hidey-hole. He got about fifteen metres or so upstream before I turned him but then made a dash for some overhanging bush. I had to hold the rod horizontal with the tip underwater in the hope of avoiding getting snagged. He made a second and third dash upstream, each time the power of his large tail registering in the bend of the delicate two weight rod that I was fishing. It meant that I couldn’t apply a lot of force but equally was protecting that gossamer tippet. The fight seemed to go on for an inordinately long time. Hereabouts for the most part the fight of the fish is short lived, even on light gear but not this time. The line jammed twice along the side of the reel, which I think had been slightly overfilled with backing, a dangerous situation when tied to a trout of this size, but I managed to clear the jam each time and maintain a modicum of control over the fish. After some minutes he was almost ready to come to the net but far too large to be able to lift his head out of the water and I stumbled around trying to get into a good position to net him. Eventually after what seemed an absolute age with heart pounding and legs shaking I landed my prize, an absolutely gorgeous dark spotted brown trout of 21 inches. Fat as a brewer’s apron and probably touching the scales at around four pounds. A massive fish for these waters, possibly the fish of a lifetime. I took some photos of him, but of course that is tricky when one is on one’s own and the fish won’t fit in the net easily. 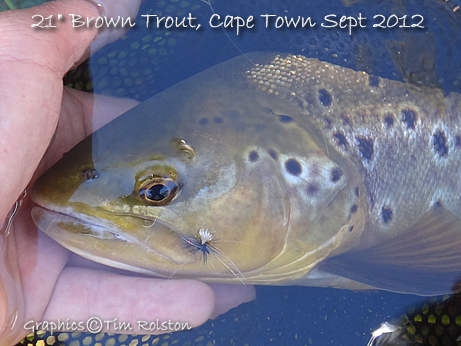 The fly in his jaw, about the largest pattern that I generally fish on these waters, looked tiny against the size of the fish’s head and after releasing him I just sat in the early summer sunshine and calmed down. Not only a fantastic fish but equally only the second fish of the season for me and the first had been spoiled by the monocular vision and lack of control brought on by the loss of that contact lens. What a start to the season. There is little hope of repeating such a capture in the near future. I have fished these rivers for about 26 years and have captured two fish this size before. One a rainbow of 22” and the other a brown of 21” but the brownie had been thin and past his prime, nothing like this specimen. Undoubtedly the heaviest fish I have ever landed from a local river, to be honest I would have been pretty happy to get him out of a stillwater somewhere. I fished on, even caught some fish,but even the ones that I would have considered large simply confirmed how huge my brown had been. I dropped a rainbow of about 18” later in the day, I didn’t even mind to see her get off, my day was complete and nothing was going to top that experience or detract from it. It had been a red letter day and eventually sunburned and tired I headed home, just hoping that some of the photos had been in focus and that I had a record for posterity. 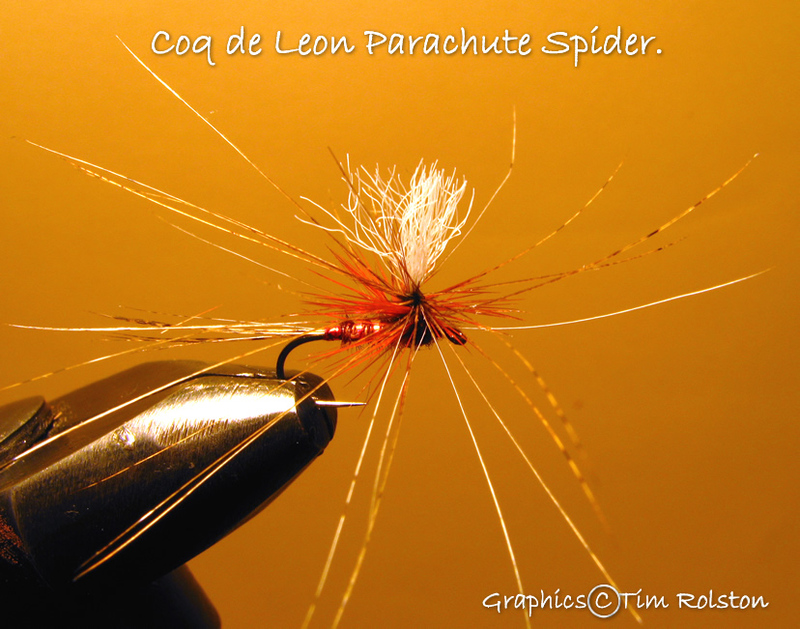 Note: The Coq de Leon parachute spider is one of the featured flies in my book, “Essential Fly Tying Techniques”, you can see how to tie it on the following private You Tube Link.